Good news! There is an excellent total lunar eclipse on October 8th, lasting over an hour. Bad news – it’s only visible in the middle of the Pacific Ocean. Good news! There is a good partial eclipse of the Sun on the 23rd. Bad news – you can only see it from the middle of the Pacific Ocean. Before you all emigrate, let’s have a look at the autumnal constellations we can see now that it gets darker so much earlier. If you start by facing south and looking straight up, Deneb, at the head of the cross of stars that form Cygnus, is obvious. To its right is the bluish star that is Vega, sitting at the top of a parallelogram of stars. This is Lyra, and further right and a little lower is the almost square shape that is the main body of Hercules. 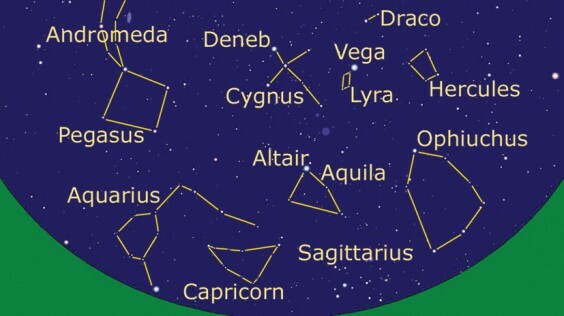 Above Hercules and making a triangle together with Lyra are two fairly bright stars which form part of the head of a little known constellation: Draco, the dragon. And a very odd constellation it is too. Quite long, it snakes its way across the sky with its tail ending just above the Plough. Near impossible to make out, a lot of imagination is required to “see” it. Back to Hercules now and just below and to the left is a sort of “coffee pot” shape of stars forming the main body of Ophiuchus, the thirteenth sign of the Zodiac. To the left of this is the bright star Altair, forming the Summer Triangle with Deneb and Vega above. Altair sits at the top of a little triangle of stars which make up Aquilla, the Eagle. Below this, but not really making a distinct pattern, is a collection of stars that form Sagittarius, although most of this constellation is lost below the horizon. The Rosetta spacecraft is orbiting a comet located in this region at the moment and it should be launching a probe to the surface soon. The comet, called 67P/Churyumov-Gerasimenko (or just 67P/C-G to its friends), won’t be visible till it gets closer to the Sun, sometime next year. To the left of Sagittarius is Capricorn, the line of stars that form the top being the easiest bit to see. Left again and a little higher, another line of stars forms the top of Aquarius, but further left and about halfway up the sky is the giant square of stars forming Pegasus, the grandest of the autumn constellations. The number of stars that you can see enclosed by Pegasus is a good indication of the amount of light pollution (or of your eyesight?). Needless to say, not many here in Alvechurch. Finally, streaming away from the left of Pegasus are two lines of stars forming Andromeda and there you are; eleven constellations, only another seventy-seven to go. Do go out and see if you can find a couple that you haven’t seen before. Don’t forget to keep an eye on heavens-above.com for sightings of the Space Station and the two possible launches during the month to re-supply it.